It’s that time again! — Here’s my annual list of the best Black Friday & Cyber Monday subscription box deals and coupons all in one place! Free boxes, coupon codes, free gift with purchase offers — if it’s subscription box related, I’ll list it below! I’ll update this post whenever a new deal comes along, so keep checking back (or bookmark this page!) so you don’t miss anything! Want more deals? Make sure to check out my big list of FREE (and really cheap) subscription boxes! Happy shopping! Kiwi Crate is a monthly craft subscription box for kids aged 4 through 8. Every box focuses on a different theme and contains a selection of fun craft projects and all of the materials needed to complete them. Boxes for other age groups include Koala Crate (ages 3-4), Cricket Crate (0-36 months), Doodle Crate (tweens), and Tinker Crate (tweens). Green Kid Crafts is a monthly creativity and STEAM (science, technology, engineering, arts, and math) box subscription service for kids ages 3 through 8 that provides all the hands-on materials needed to inspire creative and educational fun. Surprise Ride is a monthly subscription box that makes themed activity kits for children ages 6 to 11. Every box will include all of the materials for two hands-on activities, as well as a book, healthy snack, and fun extras. Kidstir is a a monthly cooking subscription box that includes recipes, tools and fun food-related activities for kids to learn from and create with adult supervision. Get 75% off your first box with coupon code CYBER75. ABCmouse.com Early Learning Academy is the leading online early education curriculum for parents, preschools and kindergartens in the US and Canada. They offer more than 2,000 books, games, songs, puzzles, and art activities, each with specific learning objectives in the subjects of reading, mathematics, beginning science, social studies, art and music. Get 50% off an annual subscription (only $45) just by using this link. Bramble Box is a fun subscription box for children aged 4 through 8 years old. Unlike many kid’s boxes which tend to focus on crafts and toys, Bramble Box encourages learning through open-ended pretend play. Junior Explorers is a fun, educational subscription box for kids 6 to 11 that allows them to explore the natural world. They’ll learn about wildlife and ecosystems, as well as the importance of protecting them. Your child will embark on a new “mission” each month, which is comprised of both physical materials as well as exclusive online content. Get 2 FREE kits when you purchase 3 with coupon code 5FOR3. Epic! is the only kids’ eBook subscription service that offers thousands of high-quality books from well known publishers like HarperCollins, National Geographic and others. FabFitFun is a lifestyle subscription box that sends you a fun assortment of beauty, fitness, and style products on a quarterly basis. New boxes are released every season and will contain a collection of full-sized products handpicked by the FabFitFun team. Items can include a mix of beauty, fashion, fitness, wellness, home products, and more. Each box is guaranteed to have a value of at least $200 in products! Gwynnie Bee is a monthly clothing rental subscription box for sizes 10 through 32. Rent unlimited outfits for one monthly price! FREE 30-day trial of Gwynnie Bee & FREE Statement Matte Lipstick in your choice of “Red Velvet” or “Spiked with Rum”! No coupon code needed — just use this link to make your color choice. Save 50% on Julep.com with coupon code CYBERWIN. Terra Bella Box is a subscription box that focuses on all natural beauty and skin care. They have two different box options to choose from. The regular Terra Bella Box includes 3-4 skincare, body care, hair, and bath items. The Makeup Edit box will only include cosmetics and will feature at least 3 items per box. Degustabox is a subscription box that sends an assortment of food and drink products to your door every month. Each box will feature at least 10 full-sized products (as well as samples) from a variety of high quality brands. Love With Food is one of the most affordable snack subscriptions out there. — It’s only $9.99/month (shipping included) for their “Tasting” box. They also have a “deluxe” box for $19.95/month (free shipping), as well as a 100% Gluten Free version for $24.99/month, which you can try for 50% off by clicking this link. Plus, with every box purchased, Love With Food donates a meal to a person in need. Try the World is a subscription box that invites your taste buds to explore a new city every month. Each box will include 7-10 locally made/grown gourmet goodies as well as cultural finds — such as music playlists and movie recommendations — produced in the city being featured. Subscriptions are $39/month, or less with multi-month commitments. KitNipBox is a monthly subscription box that delivers high-quality cat toys, all natural treats, and other fun products for your cat. Each box will contain an assortment of products designed to keep your cat happy, healthy, and fit. Items can include toys, delicious treats, must have accessories, health & hygiene products, innovative gadgets, and more. Book of the Month (BOTM) is a subscription that sends you a new hardcover book as chosen by a panel of judges every month. You’ll be given a choice between five different book selections which will be revealed on their site on the first of the month. The books will include a broad range of genres and offer a mix of both fiction and nonfiction titles. Sock Panda is a monthly subscription that delivers a fun pair of socks to your door every month. They also donate a pair to those in need for every subscription purchased. Plans are available in women’s, men’s, tweens, and kid’s sizes. GlobeIn is a monthly subscription box that features handcrafted goods by artisans around the world. Each month features a new theme with products supplied by various artisans. Many of the products included are eco-friendly, fairly traded, and/or organic. 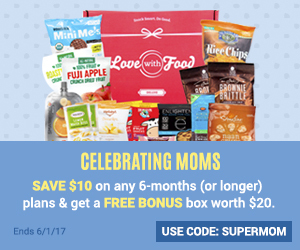 Ecocentric Mom: Save 20% on any length gift subscription + a free set of Baby Milestone Stickers with coupon code GIVETHANKS — or — Save 40% on your first month with coupon code ECOHOLIDAY. Junior Explorers: Get 2 FREE kits when you purchase 3 with coupon code 5FOR3. Surprise Ride: Save 50% on your first month with coupon code FRIDAY50. Honest Company: Save 50% on your first bundle plus free shipping with coupon code CYBER50. Kidstir: Save 75% on your first month with coupon code CYBER75. FabKids: Get your first outfit for just $9.95 shipped! Gwynnie Bee: FREE 30-day trial of Gwynnie Bee & FREE Statement Matte Lipstick in your choice of “Red Velvet” or “Spiked with Rum”! No coupon code needed — just use this link to make your color choice. Beauteque BB Bag: Save 50% off your first month of a 3-month subscription with coupon code 50OFF3. Julep: Save 50% site-wide with coupon code CYBERWIN. Amazon: Get a Luxury Beauty Sample Box for $19.99 and receive an equivalent credit towards your next purchase of select luxury beauty products. Birchbox: Get a FREE bonus box with any new subscription with coupon code TWOFORSOME. PB&Jealous: Save 25% on your first month with coupon code 25OFFCYBERMONDAY. MunchPak: Save 50% on your first month with coupon code CYBER50. Trendy Butler: Save 50% on your first month with coupon code POW32. Chroma Club: Get $3 off your first month with coupon code COLORZEN. Indigo Artbox: Get your first box for just $9.99 with coupon code INDIGOART. Darby Smart: Get your first month FREE just by using this link.